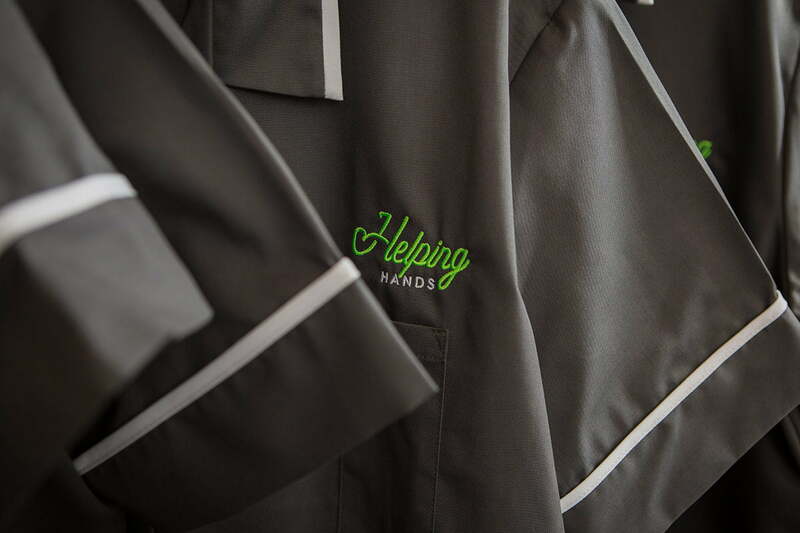 Improvement changes within Helping Hands are now being reflected in our company brand, communications and other materials. The roll-out and implementation of an extensive investment and culture change programme which started during the summer of 2017 are now becoming more visible to staff and the people we care for. The first visible evidence of change is our logo and a new website. Gone is the dated logo and website to be replaced with a modern, striking fluorescent green logo along with a highly responsive and informative website. The new-look company identity, produced by Newcastle-based Room 8 Design, has been designed to stand-out and highlight the energy within the organisation. The hand script typeface promotes our personalised, hands-on approach to care. This new look and style will be carried across and standardised on all other materials including a strongly branded uniform for care workers. Our managing director David Harrison explained: “Helping Hands has been going through a significant period of investment and change during 2017. While there has been some disruption, I am delighted with the way this has progressed and how well our staff have embraced these changes. “We are committed to driving forwards our improvement plan and a company-wide rebrand is the visible culmination of this change in our approach. “The company name remains the same but the new logo better reflects our vision for the future and the energy we intend to bring to delivering high-quality care to our service users.